He may speak the language of modernity and change, but in many ways Britain's new prime minister David Cameron is a throwback to an earlier era of Conservative leaders. Not only is he the first former pupil of Britain's top private school, Eton, to hold the office since the early 1960s, he can also trace his ancestry back to William IV, making him a distant relative of the Queen. Mr Cameron has never made any secret of his privileged background, but he has also sought to cultivate a fresh, unstuffy image. 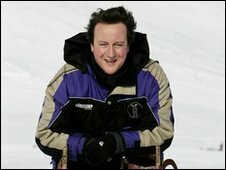 At 43, he is the youngest prime minister since Robert Banks Jenkinson, the 2nd Earl of Liverpool in 1812. He is six months younger than Tony Blair when he entered Downing Street in 1997. Like Mr Blair, he has a young family and an informal, self-consciously modern approach to politics. Mr Blair arrived at Number 10 with a guitar case in hand. Mr Cameron has his cycling helmet on his handlebars and fondness for indie rock. Yet despite opening himself up to the TV cameras like few other British political leaders, Mr Cameron is still something of an unknown quantity. Friends talk of a witty, self-deprecating character, a devoted family man who loves to throw weekend parties at his Oxfordshire constituency home and who hates "talking shop". Family: Married to Samantha, with two children and baby on the way. First child Ivan died in 2009. But some who have had dealings with him on his rise to power, and during his brief career in business, recall a "slippery", "ruthlessly ambitious", somewhat guarded individual. So who is the real David Cameron? The third of four children, David William Duncan Cameron, was born on 9 October 1966 in London. He spent the first three years of his life in Kensington and Chelsea before the family moved to an old rectory near Newbury, in Berkshire. Mr Cameron has said he had a "happy childhood", but one where "whingeing was not on the menu". His stockbroker father Ian was born with severely deformed legs, which he eventually had to have amputated. He has also lost the sight in one eye, but David's father said he never considered himself "disabled" and rarely complained about anything. Mr Cameron's mother, Mary, served as a Justice of the Peace for 30 years. During her time on the bench she passed judgement on the Greenham Common protesters, including on one occasion her own sister, Mr Cameron revealed recently, and eco-warrior Swampy, who was protesting against the construction of the Newbury bypass. At the age of seven, the young Cameron was packed off to Heatherdown, a highly exclusive preparatory school, which counted Princes Edward and Andrew among its pupils. Then, following in the family tradition, came Eton. School friends say Mr Cameron was never seen as a great academic - or noted for his interest in politics, beyond the "mainstream Conservative" views held by most of his classmates. He has described his 12 O-levels as "not very good", but he gained three As at A-level, in history, history of art and economics with politics. Reportedly his biggest mention in the Eton school magazine came when he sprained his ankle dancing to bagpipes on a school trip to Rome. Before going up to Oxford to study Philosophy, Politics and Economics he took a gap year, working initially for Sussex Conservative MP Tim Rathbone, before spending three months in Hong Kong, working for a shipping agent, and then returning by rail via the Soviet Union and Eastern Europe. At Oxford, he avoided student politics because, according to one friend from the time, Steve Rathbone, "he wanted to have a good time". He was captain of Brasenose College's tennis team and a member of the Bullingdon dining club, famed for its hard drinking and bad behaviour, an episode Mr Cameron has always refused to talk about. He has also consistently dodged the question of whether he took drugs at university. But he evidently did not let his extra-curricular activities get in the way of his studies. His tutor at Oxford, Professor Vernon Bogdanor, describes him as "one of the ablest" students he has taught, whose political views were "moderate and sensible Conservative". After gaining a first class degree, he briefly considered a career in journalism or banking, before answering an advertisement for a job in the Conservative Research Department. Conservative Central Office is reported to have received a telephone call on the morning of his interview in June 1988, from an unnamed male at Buckingham Palace, who said: "I understand you are to see David Cameron. "I've tried everything I can to dissuade him from wasting his time on politics but I have failed. I am ringing to tell you that you are about to meet a truly remarkable young man." Mr Cameron says he did not know the call was being made or who made it, but it is sometimes held up by his opponents as an example of his gilded passage to the top. As a researcher, Mr Cameron was seen as hard-working and bright. He worked with future shadow home secretary David Davis on the team briefing John Major for Prime Minister's Questions, and also hooked up with George Osborne, who would go on to be shadow chancellor and his leadership campaign manager. Other colleagues, in what became known as the "brat pack" were Steve Hilton, now one of Mr Cameron's closest strategy advisers, and Andrew Lansley, expected to be the new health secretary. These young researchers were credited with devising the attack on Labour tax plans that unexpectedly swung the 1992 general election for John Major. Mr Major described Cameron as an "an extraordinarily able and bright young man," and praised his "coolness and his capacity to think under pressure." But the remainder of Mr Cameron's time as a backroom boy in the Conservative government was more turbulent. He was poached by then Chancellor Norman Lamont as a political adviser, and was at Mr Lamont's side throughout Black Wednesday, which saw the pound crash out of the European Exchange Rate Mechanism. By the early 1990s, Mr Cameron had decided he wanted to be an MP himself, but he also knew it was vital to gain experience outside of politics. So after a brief spell as an adviser to then home secretary Michael Howard, he took a job in public relations with ITV television company Carlton. Mr Cameron spent seven years at Carlton, as head of corporate communications, travelling the world with the firm's boss Michael Green, who has described him as "board material". "I tried to persuade him that he could have a really good career in industry, but he was completely resolute about going back to politics, and I respected him for that. He's good, he's the real McCoy," Mr Green told The Independent. But Mr Cameron's period at Carlton is not remembered so fondly by some of the journalists who had to deal with him. 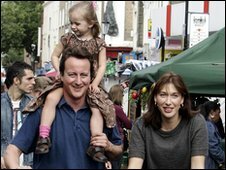 Jeff Randall, writing in The Daily Telegraph in 2005, said he would not trust Mr Cameron "with my daughter's pocket money". "To describe Cameron's approach to corporate PR as unhelpful and evasive overstates by a wide-ish margin the clarity and plain-speaking that he brought to the job of being Michael Green's mouthpiece," wrote the ex-BBC business editor. Former Sun business editor Ian King, recalling the same era, has described Mr Cameron as a "poisonous, slippery individual". Mr Cameron went part-time from his job at Carlton in 1997 to unsuccessfully contest Stafford at that year's general election. Four years later, in 2001, he won the safe Conservative seat of Witney, in Oxfordshire, recently vacated by Sean Woodward, who had defected to Labour. Mr Cameron was by now a married man with a family. His wife, Samantha, is the daughter of landowner Sir Reginald Sheffield. She grew up on the 300 acre Normanby Hall estate, near Scunthorpe. Music: Bob Dylan and indie rock such as The Killers, The Smiths, Radiohead and Pulp. Drink: Guinness and real ale. Luxury item on Desert Island Discs was "a case of malt whisky from Jura"
Her stepfather, Viscount Astor, was a minister in John Major's government, with responsibility for broadcasting. 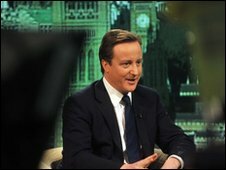 Before becoming Tory leader in 2005, Mr Cameron sat on the board of late night bar operator Urbium with Viscount Astor. Mrs Cameron, who works as the creative director of upmarket stationery firm Smythson's of Bond Street, which counts Stella McCartney, Kate Moss and Naomi Campbell among its clients, has been credited with transforming her husband's "Tory boy" image. She has a tattoo on her ankle and went to art school in Bristol, where she says she was taught to play pool by rap star Tricky. 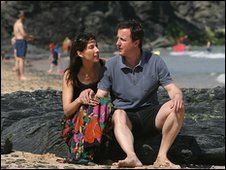 The couple were introduced by Mr Cameron's sister Clare, Samantha's best friend, at a party at the Cameron family home. They were married in 1996. They have two young children, Nancy and Arthur, with another baby due in September. Their first child, Ivan, who was born profoundly disabled and needed round the clock care, died in February 2009. The experience of caring for Ivan and witnessing at first hand the dedication of NHS hospital staff, is said by friends to have broadened Mr Cameron's horizons. He had, friends say, led an almost charmed life, to that point. 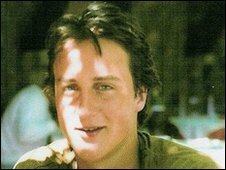 In a message to party activists after Ivan's death, Mr Cameron said: "When we were first told the extent of Ivan's disability I thought that we would suffer having to care for him but at least he would benefit from our care. "Now as I look back I see that it was all the other way round. It was only him that ever really suffered and it was us - Sam, me, Nancy and Elwen - who gained more than I ever believed possible from having and loving such a wonderfully special and beautiful boy." On entering Parliament in 2001, Mr Cameron rose rapidly through the ranks, serving first on the Home Affairs Select Committee, which recommended the liberalisation of drug laws. He was taken under the wing of Michael Howard, who put him in charge of policy coordination and then made him shadow education secretary. He also had the key role of drafting the 2005 election manifesto. But when he entered the race to succeed Mr Howard as party leader in 2005 few initially gave him a chance. He was a distant fourth at the bookmakers behind Ken Clarke, Liam Fox and frontrunner David Davis. It took an eye-catching conference speech, delivered without notes, in what would become his trademark style, to change the minds of the party faithful. A few may have had second thoughts, when in the early months of his leadership he spoke about how some young offenders just needed love (caricatured by his opponents as his "hug a hoodie" speech) and was pictured with huskies in the Arctic Circle on a trip to investigate climate change. 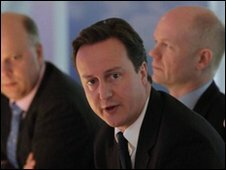 At the start of his leadership, Mr Cameron was all about sunny optimism and "sharing the proceeds of growth". He told activists in his first party conference speech to "let sunshine win the day" and managed to get a round of applause for a mention of civil partnerships. The media, eager for a new story after years of Tory failure and with an increasingly unpopular Labour government, gave him the glowing coverage he craved, helping him to "decontaminate" the Tory brand and move the party back towards the centre ground, where, the conventional wisdom has it, British elections are won and lost. He ordered the party to end its obsession with Europe and tried to reposition it as the party of the environment and the NHS, as well as recruiting more women and candidates from ethnic minorities to winnable seats. He also cannily used the expenses scandal that rocked Westminster to portray himself as a radical reformer bent on cleaning up politics. He was helped in his mission by many older, more traditionally-minded Tory MPs being forced to retire to make way for younger "Notting Hill Tories" - as Mr Cameron's fashionable, Metropolitan supporters came to be called. He was rewarded with big poll leads - but the financial crisis forced Mr Cameron to ditch much of his upbeat rhetoric, in favour of a more sober, even gloomy, approach, warning voters they face tough times and spending cuts ahead. Despite his change of tone, and with the exception of a brief period when Gordon Brown enjoyed a bounce in the polls after becoming leader in 2007, Mr Cameron has ridden high in the polls throughout his time as leader. But during the course of the general election campaign, he watched much of that poll lead evaporate, with the rise of Lib Dem leader Nick Clegg, a man with a similar background and smooth, telegenic manner. He was no longer the fresh, new face on the block. What's more, his big idea, The Big Society, the fruit of detailed policy work stretching back to the early days of his leadership, which envisaged parents setting up their own schools and groups of public sector workers forming cooperatives, failed to capture voters' imagination in the way he had hoped. But after losing out to Mr Clegg in the first televised prime ministerial debate, he managed to regain his poise and, according to most of the instant viewer polls, came out on top in the two that followed. Mr Cameron and his inner circle still had hopes of winning an outright victory, as Britain went to to the polls. But despite gaining 97 seats, the Conservatives' biggest increase in decades, they fell just short of the majority they needed to form a government and Mr Cameron was forced into coalition talks with Mr Clegg's Liberal Democrats. Before he was elected Conservative leader in 2005, David Cameron famously described himself as the "heir to Blair". There are certainly similarities with the way he has used a small group of modernisers to force change on a reluctant party, even if it did not, in the end, produce the same seismic effect at the ballot box. And like Mr Blair in his early days, Mr Cameron's political philosophy is sometimes difficult to pin down. He recently told The Daily Telegraph he did not trust people with a "grand vision," saying he was "a practical person, and pragmatic". If he could sum up his approach to politics in one word, he told the newspaper, it would be "responsibility". He may learn the true meaning of that word in the weeks and months to come.